Promotion of System of Rice Intensification (SRI) in Ganjam. 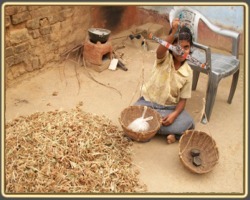 To promote the concept of SRI methods and Organic cultivation. Awareness generation, Mass meetings, trainings and establishment of community Institutions. 59 villages, 19 G.P.S, 03 Blocks of Ganjam district. 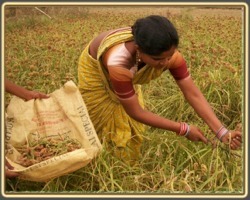 The activities of the project emphasis on collection of data regarding the farmers (i.e. land pattern, livestock population, manure practice and crop pattern) & motivate them for SRI cultivation. Side by side, it is also undertake capacity and skill development of the farmers and project personnel, input support for small and marginal farmers with practical demonstrations. Linkage with Govt. departments in promotion of Govt. Schemes. Focus Farmers profile has been created after base line survey as per the format suggested by C W S.
52 mass meetings were organized during the period covering 1495 farming families of 52 focus villages. As planned the project has successfully demonstrated its ability in organizing master trainers training with the facilitation of C W S where in key project volunteers from 4 implementing partners were participated. 54 Video shows were organized in project villages to create awareness among the farmers on benefits of SRI process and organic cultivation. The project availed green manure Dhanicha seeds and purchased 13. 4 qntls. at subsidized cost from Govt. which was distributed among farmers to cultivate 109 acres of land, 42 kgs of Sun hemp seeds were procured and cultivated in 4 acres of land, mixed green manure seeds like green gram, til and dhanicha were cultivated in 4 acres of land. 407 farmers are preparing & using Vermin- compost & Vermin-wash in their SRI Field. Farmers have also preparing Magic-compost & Medicinal Magic-compost to put in their land as organic nutrient. 152 nos. weeding equipment supply to SRI farmers. 237 farmers have been identified and trained on Rabbi Season Paddy& Ragi using SRI process and vegetables through organic farming. 7 Nos. of cluster level training programme on Rabbi Season crops were organized where 237 M-123 & F-114 farmers from 52 villages were participated. 10 farmers in 5 villages Practice SRI Paddy in Rabi season of 2.5 acres of land. 72 farmers in 9 villages Practice Ragi in SRI process of 16 acres of land in Rabi season. 155 farmers in 12 villages Practice Organic Vegetables, Pulses & Spices in66.28 acres of land. Crop cutting of 332 SRI farmers were recorded in 42 villages in presence of personnel from Agriculture Dept., Revenue Dept., representatives of PRI, Media & Farmers. 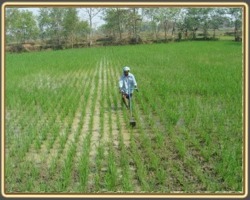 The highest production of paddy per Hector is 8 tones and Average paddy production per Hector is 7.3 tones. 4 Issues of Newsletter on SRI and Organic cultivation was circulated among all the practicing and non-practicing farmers in the project area. 3 Seed Banks have been established in 3 Blocks with 200kgs of Dhannicha seeds, 500 kgs of paddy seeds, 100 kgs of sun hemp seeds &100 kgs of maize seeds. Organic Product Sales Out-Let, Amrita, is well functioning at Chatrapur.